Blog content is produced by the OIL Commissioner, unless otherwise noted. 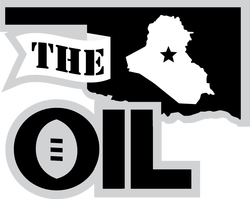 The original OIL logo was designed by James Horinek. The streamlined OIL logo, as well as the 10th-anniversary OIL logo, was designed by Breakfast Supply Co. The AFC, NFC, and PFC logos, as well as their championship game logos, were also designed by Breakfast Supply Co. The AFC's and NFC's uniforms were designed by Andrew Krause Design. The PFC's uniforms were designed by Michael Taylor Design.